For the 1970s car produced by British Leyland and referred to in certain markets as the "Austin Princess", see Princess (car). Austin Princess III 3995cc, registered March 1954. This car is not completely representative, having special "bespoke" headlights. 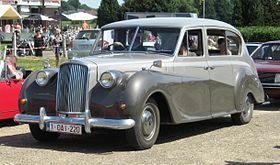 The Austin Princess is a series of large luxury cars that were made by Austin and its subsidiary Vanden Plas from 1947 to 1968. The cars were also marketed under the Princess and Vanden Plas marque names. From October 1962 Princess was used on a deluxe version of the Austin/Morris 1300. From September 1975 Princess was used as a name for mass-produced family cars in Leyland's 1800/2200 former Austin/Morris/Wolseley range. The first Austin Princess A120 was launched in 1947 as the most expensive flagship model in the Austin range at the same time as the A110 Austin Sheerline (designed during the war) which body was built on the same chassis at Longbridge, the A110 produced 10 less horsepower being fitted with a single carburetter. Both cars always had bodies that were massive and heavy in appearance. 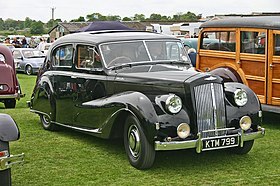 The Princess (model code A120) featured a body by the coachbuilder Vanden Plas and was a large saloon or limousine. The car was offered with two distinct interiors. 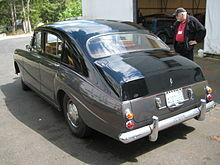 The "DM" or limousine type had a sliding glass partition between the driver and rear passengers plus picnic tables, and the "DS" was the saloon. The saloons were successful as a top-executive car, many Princesses (and Sheerlines, for that matter) were bought for civic ceremonial duties or by hire companies as limousines for hire. The standard saloon weighed almost two tons, was 16 ft 9 inches long and 6 feet 1¼ inches wide on a 10-foot 1¼-inch (the short) wheelbase. The Princess model was updated over the years through Mark I (A120), Mark II (A135) and Mark III versions, the largest variation being the introduction of the long-wheelbase version in 1952 with a longer body and seven seats: apart from that the bodywork and running gear hardly changed, nor did the 4-litre straight-6 engine. The radiator was fairly upright in old-fashioned style and the car had separate front wings, but these cars were always more modern in style than the equivalent-sized Bentley or Rolls-Royce and, for the saloon, the price was little more than two-thirds of the Rolls-Royce. From August 1957 the Austin part of the badging was dropped so it could be sold by Nuffield dealerships. From May 1960, the Vanden Plas name was added in front of "Princess". In 1947, Austin produced two virtually identical chassis, one for the A110 (later A125 Sheerline, built entirely by Austin at their Longbridge factory) and the A120 (later A135) chassis used by Vanden Plas to produce the Princess at their Kingsbury works (North London). Although Vanden Plas was by now wholly owned by Austin and much of the running gear and instrumentation was the same in the two cars, the Princess was the Austin flagship, with a higher specification leather, wool and burr walnut interior. The original Princess was powered by a 3.5-litre straight six engine. This was enlarged to a 4.0-litre unit without further modifications. The Princess was often built to order. Customers could specify the colour required and a range of different setups were available. These included triple or single carburetors and twin or single exhaust systems. Whilst the sportier multiple carb version performed better, it achieved only 12 to 14 mpg. The single carburetor version gave slightly better fuel consumption. Performance was good for a car of its size, with a top speed of 90 mph (140 km/h) and acceleration 0 to 60 mph in 20 seconds. In 1950, the Limousine version was introduced. The chassis length and passenger area were enlarged to enable a pair of drop down seats to be mounted on the rear of the front seats and a glass division was standard. These early cars are now extremely rare, especially the saloon versions. Many of the saloons were converted for use as taxis in the late 1950s, fitted with Perkins diesel engines for better economy. The 3993cc 6-cylinder engine was also fitted, as a petrol option seldom taken up, to the Austin and Morris normal-control (i.e. "bonneted") WEK and WFK commercial vehicles. During the life of this model (in 1952), Austin became part of the British Motor Corporation (BMC). The Austin Princess IV was introduced in 1956. Offered in Saloon and Touring Limousine models, this replacement for the former Sheerline and A135 only stayed in the catalogue until 1959; 200 were built. The last A135 Mark 3 had been priced at five times the price of an Austin A30. The new IV had to be priced at 6.5 times the price of an Austin A30, at which price there was almost no demand. The name was shortened in August 1957 when the car lost its "Austin" designation, now being branded simply as the Princess IV  so it might be sold by either Morris or Austin dealers. The Times tested the Princess IV and reported on it at some length in early February 1959. The Princess IV was discontinued in 1959 and replaced in the catalogue by a much smaller model, an upgraded Austin Westminster (Pininfarina-designed Vanden Plas Princess see below), which retailed at little more than 40 per cent of the Mark IV's price. An Austin Princess IV was road tested by The Autocar magazine on 3 October 1958, as No.1703 in the series. The engine was rated at 150 bhp (gross) and it returned a maximum speed of 98.7 mph, under the test conditions prevailing. The Austin A135 Princess Long Wheelbase Saloon (DS6) and Limousine (DM4) were introduced in 1952. The automatic transmission and power steering from Princess IV were fitted from 1956. The marque name was changed from Austin to Princess in August 1957, and then to Vanden Plas  from July 1960. The long wheelbase models continued to be built by hand in limited numbers as the Vanden Plas Princess 4-litre Limousine, until 1968. All now being parts of British Leyland, the Jaguar Mark X-based Daimler DS420 was initially produced at the Vanden Plas works in Kingsbury, North London then replaced the Vanden Plas Princess within the new, slightly rationalised range. This had been foreseen in 1966 when British Motor Holdings (BMH) had brought BMC and Jaguar together, and stopped development at Vanden Plas of the potential successor car. The limousine was luxuriously appointed with lots of polished wood, optional mohair rugs and radio with controls in the armrest. Among the long list of available extras were monograms and a flagstaff. The driving compartment was separated from the rear of the car by a division with an optional telephone for the passengers to communicate with the driver. The driving seat was finished in leather but the rear seats were trimmed in cloth, the usual arrangement on many luxury cars of the time. Though not as durable as leather, cloth was considered kinder to passengers' clothes. To increase seating capacity two occasional seats could be folded out of the floor. The car had independent coil suspension at the front with semi elliptic leaf springs and anti roll bar at the rear. The cam and peg type steering gear had optional power assistance. An Austin A135 Princess Long-wheelbase Limousine tested by The Motor magazine in 1953 had a top speed of 79 mph (127 km/h) and could accelerate from 0-60 mph (97 km/h) in 23.3 seconds. A fuel consumption of 15.1 miles per imperial gallon (18.7 L/100 km; 12.6 mpg‑US) was recorded. The test car cost £2480 including taxes. An automatic Limousine was tested by the British magazine The Motor in 1962 and had a top speed of 86.2 mph (138.7 km/h) and could accelerate from 0-60 mph (97 km/h) in 23.5 seconds. A fuel consumption of 15.8 miles per imperial gallon (17.9 L/100 km; 13.2 mpg‑US) was recorded. The test car cost £3,473 including taxes. The Vanden Plas Princess 1100 was launched in 1963 as a luxury variant of the BMC ADO16. Production of the Princess 1100 and subsequent 1275 and 1300 models ended in 1974  with 43,741 examples produced. The final use of the "Princess" name was for the Princess 1800 / 2200 of 1975–78 and the Princess 2 1700 / 2000 / 2200 of 1978–81. This was not badged as an Austin on the home market (although it was badged as such in New Zealand), but was sometimes confused with one because for the first year of its life it was marketed (variously) as the Austin, Morris, and Wolseley 18–22 Series. It was succeeded by the Austin Ambassador in 1982 and thus marked the end of the Princess marque, although the Vanden Plas name continued as the most luxurious trim level in the Rover SD1 range. ^ "Leyland's Princess". The Times (59498). 11 September 1975. p. 27, col A. ^ "New Austin Cars". The Times (50709). 14 March 1947. p. 6, col G.
^ a b c d e "The Austin A135 Princess Long-wheelbase Limousine Road Test". The Motor. 29 July 1953. ^ a b c d e f g h i "Power And Control Of The Princess". The Times (54375). 3 February 1959. p. 5. ^ "New Austin Model". The Times (53652). 3 October 1956. p. 5, col F.
^ "Advertisement for the Austin Princess IV". The Illustrated London News. 9 March 1957. p. 2. ^ "London Motor Show". The Times (53972). 15 October 1957. p. 17. ^ a b c d e "The Vanden Plas 4-Litre Princess Limousine". The Motor. 11 April 1962. ^ "Princess Models". The Times (54821). 12 July 1960. p. 7, col F.
This page was last edited on 10 January 2019, at 00:29 (UTC).